Temporal artery ligation has been a surgical procedure done for decades. It has been historically used as a medical procedure to diagnose temporal arteritis as a biopsy technique. In this operation a section of the anterior branch of the superficial temporal artery is removed behind the front edge of the temporal hairline. More recently, temporal artery ligation is being done for aesthetic purposes. Almost always men, prominent or protruding arterial patterns from the temporal area up onto the forehead can be seen as an aesthetic liability. These vessels can become quite large as they dilate from exercise, heat and alcohol intake. While such temporal artery prominences can occur in women, they appear to occur far less frequently. This may be due to hormonal differences but also in the differing thicknesses of the muscular walls between the genders. The aesthetic treatment of prominent temporal arteries requires a dynamic knowledge of the anatomy of the superficial temporal artery. 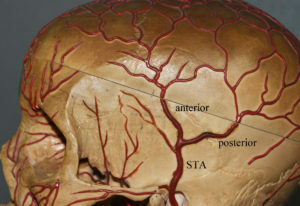 (STA) The STA arises from the external carotid artery where it courses in front of the ear towards the temporal region. As it passes the ear and into the temporal hairline it splits into a Y about at a point 1 cm anterior to the root of the ear and the 2 cms above that point. 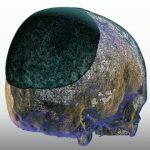 The frontal or anterior branch of the STA is what extends into the forehead and is the source of vessel prominence. 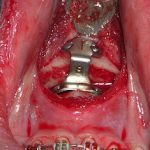 In looking at its anatomy, two observations are extremely relevant when considering ligation for aesthetic reduction in its size. First, the anterior branch turns into numerous smaller arteries whose patterns are both tortuous and unpredictable as it goes into the forehead. Thus what one sees as prominent is often an incomplete reveal of the complete arterial branching pattern. Secondly, there is a vast anastomotic pattern into the scalp with numerous interconnections between them. This means that the consideration of backflow must be factored into the location and number of ligation points. 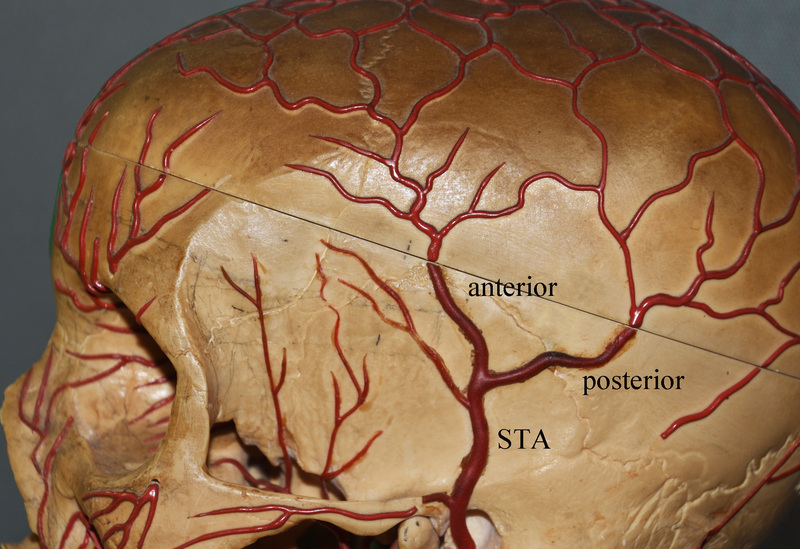 The anatomy of the STA shows that simply tying off the main trunk of the STA will not likely work and, even if it does, its results will likely be temporary. Blood flow through the numerous superior branches will find its way back down and the vessels again. The first ligation point must be just after the take-off at the Y junction. Then one, two or three more distal ligations points must be done in an effort to cut off the backflow into the visible vessels. These can be determined by either their visibility or palpabiity. Sometimes they are not easy to initially locate but one had to look for them as they are the key to a successful long-term result.